Home » Peru Lima. 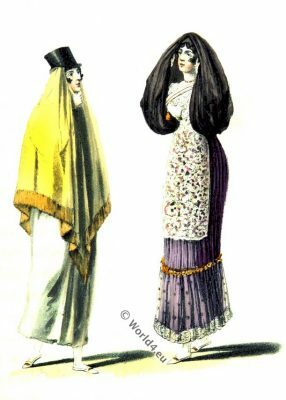 Female fashion in 1821. Lima is the capital of the South American Andean state of Peru. Lima is located on the Río Rímac at the foot of the dry western flank of the central Peruvian Andes. On 18 January 1535 Lima was founded by the Spanish conquistador Francisco Pizarro under the name of Ciudad de los Reyes (town of the kings) on a native settlement on the south bank of the river Rimac. Lima became the center of the oppressive measures against the indigenous population for the Peruvian region, including the Inquisition of the Catholic Church against old religious customs, rites and against the ancient healer medicine. In December 1820 a rebel army led by the revolutionary José de San Martín defeated the Spaniards in the Battle of Pisco and occupied Lima. On July 28, 1821, San Martín officially proclaimed Peru’s independence. A phase of industrialization began in the middle of the 19th century, and the first railway line in South America was opened in the Peruvian capital in 1851. Source: Narrative of a Visit to Brazil, Chile, Peru and the Sandwich Islands during the years 1821 and 1822. With miscellaneous remarks on the past and present state, and political prospects of those countries, by Gilbert Farquhar Mathison. 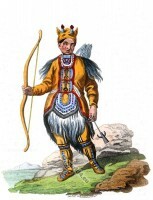 Published at London in 1825 by C. Knight. Lucerne Entlebuch. 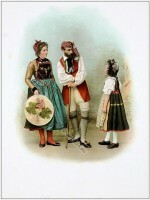 Switzerland national costumes.